The Supreme Court has repealed the order it issued on February 1 to reinstate 12 lawmakers who the Elections Commission disqualified for floor crossing. The Attorney General’s Office filed a procedural motion with the Supreme Court requesting repeal of the sections in the February 1 order which overturned the court’s judgement on floor crossing, the order to reinstate the 12 lawmakers and allow them to attend People’s Majlis sittings, and the order to ask for Supreme Court’s instructions on appointing chief judges at courts. 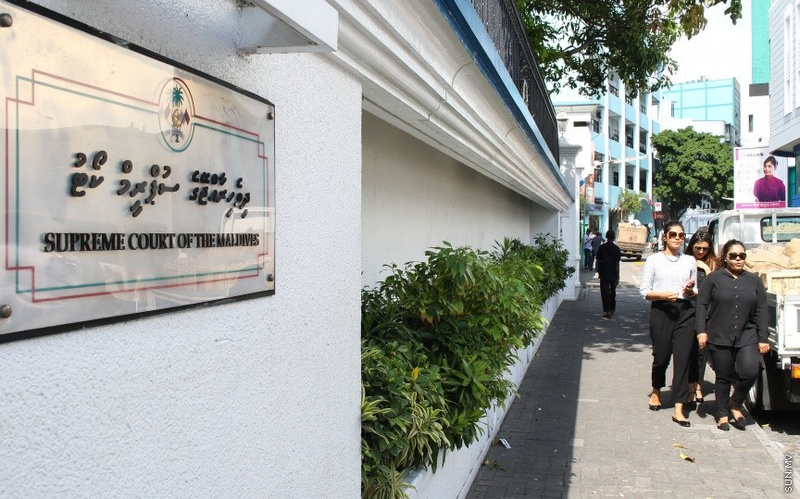 The five judges at the Supreme Court this Wednesday granted the AG’s Office’s request and repealed the order to overturn the court’s earlier judgement on floor crossing and the order to reinstate the 12 lawmakers and allow them to attend Majlis sittings. The only section of the February 1 order which hasn’t been repealed is the order to consult with the Supreme Court before appointing chief judges to courts. This Wednesday’s judgement was passed with the unanimous vote of Chief Justice Dr. Abdulla Didi, Judge Areef, Judge Adam Mohamed, Judge Abdulla Didi and Judge Abdul Ghanee. Repealing the order on floor crossing, the judges said banning floor crossing was an important rule to uphold in order to maintain the multi-party system in the country. And repealing the order to reinstate 12 lawmakers, the judges said they made their judgement based on conflict of opinion over their seats and the cases filed with the court regarding the seats of the 12 MPs. The judges said they chose not to repeal the order to consult with the Supreme Court before appointing chief judges because it was the responsibility of the court to establish justice. The judges also dismissed procedural motions filed by the AG’s Office with its request for repeal of the February 1 order. AG’s Office had argued that the February 1 court order was invalid as it was issued by former Chief Justice Abdulla Saeed and former Supreme Court Judge Ali Hameed with criminal intent and by conning other Supreme Court judges; and that Supreme Court has the authority to review its judgements. The Supreme Court judges said the criminal intent of a judge will not invalidate his/her judgement; and that judgements by the court can be reviewed, but only under special circumstances, as practiced by several other foreign countries. The judges said the court dismissed requests for reviews of judgements by the court in previous cases not because of lack of authority, but because there hadn’t been any reason to review the court’s judgements on those cases.